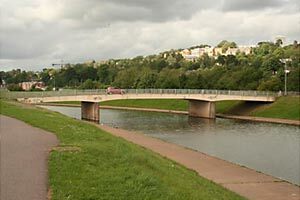 After the devastating floods of St Thomas and Exwick in 1960, plans were drawn up to construct a flood prevention scheme for Exeter. The main Exwick Flood Channel was built parallel to the river past St Davids Station. Station Road bridged the channel with a purpose built, concrete bridge. The whole flood scheme was built between 1965 and 1977. See the Exeter Floods in 1960 for a full history.